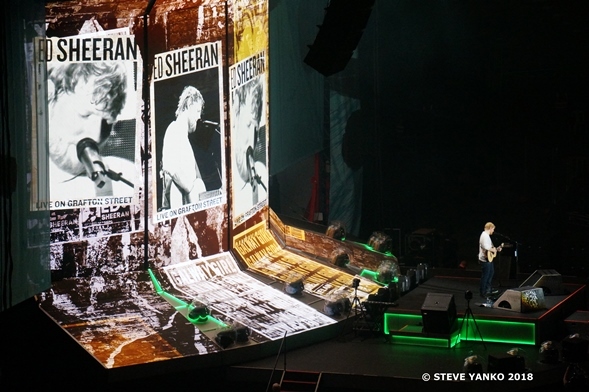 Ed Sheeran – Melbourne March 12th 2018 – Concert Review - SY Music - Music Lessons. Consulting. Music Production. Last night I attended my first Ed Sheeran concert and I left the concert feeling happy and inspired because I just watched a musician perform by himself on stage, in a massive stadium and lift the spirits of thousands of people. From the moment people could see Ed Sheeran walk to the stage, they began to scream and the atmosphere in the stadium became electric. 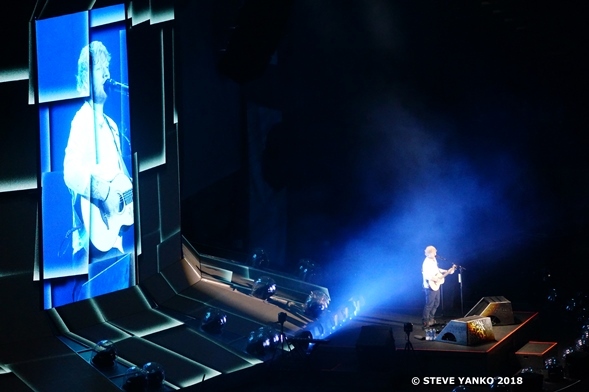 The show began with the massive hit song ‘Castle on the Hill’ in which Ed Sheeran used a loop station (musical device) to create different parts of the song using his guitar and voice. 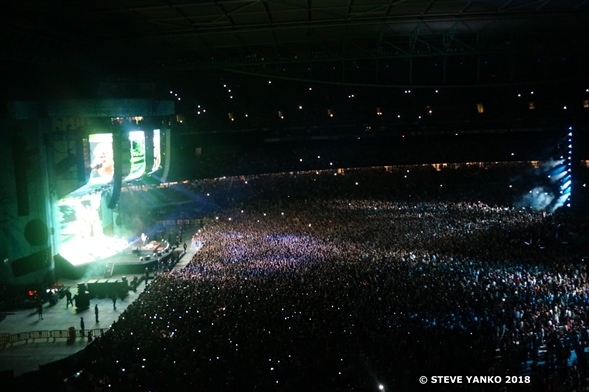 Ed Sheeran performing to a massive audience in Melbourne. Ed Sheeran is one of the most successful song writers and performers in the world. 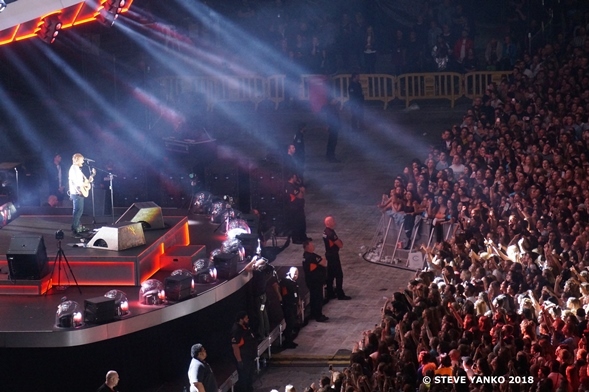 In this concert he played many of his hit songs such as ‘Castle on the Hill’, ‘The A Team’, ‘Lego House’, ‘Galway Girl’, ‘Photograph’, ‘Perfect‘, ‘Thinking Out Loud’, ‘Sing’ and ‘Shape of You’. Ed Sheeran used a guitar & a loop station in his concert. Ed Sheeran regularly spoke to the audience in between songs as if he was talking to his friends. He encouraged the “boyfriends and Super Dads” chaperoning their kids to enjoy the show and for people in general to have a good time, to get “weird” and to sing as loud as they could. Even though Ed Sheeran encouraged people to sing as loud as they could he really didn’t need to. Ed Sheeran’s beautiful songs naturally lead people to sing. As is always the case for me, I love hearing the audience sing at concerts and last night’s audience sounded fantastic and did not disappoint while singing the songs of Ed Sheeran. Unfortunately in today’s pop music there aren’t many “guitar heroes” which young people can hear on commercial radio. When was the last time you heard a great guitar solo on a new song on the radio? 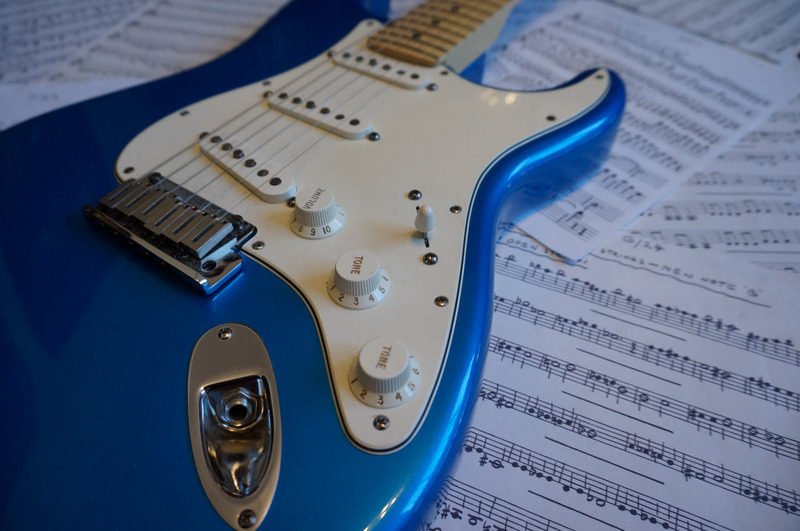 Where in today’s music is the new Jimi Hendrix, Eric Clapton, BB King, Buddy Guy, David Gilmour, Prince, Mark Knopfler or Ian Moss? As a music & guitar teacher I can confidently state that Ed Sheeran is inspiring young people to pick up a guitar and start playing. Many of my students are musically influenced by him and that is great. People waving their mobile phone torches to Ed Sheeran. Last night I saw that Ed Sheeran is a fantastic guitarist, especially with his rhythm playing. However, Ed Sheeran has revolutionised the way guitarists can work in a live environment by using the loop station the way he did in concert. I thoroughly enjoyed watching him play a chord progression, then add a single note pattern (a riff) over the loop and then create a percussive beat with his guitar and add vocal harmonies to create a great backing tracking for his song. I don’t know if everybody appreciates how much thinking and talent is needed to create these loops but I absolutely loved watching Ed Sheeran perform in this way. Ed Sheeran performed so many great songs for his fans. Ed Sheeran is the real deal in that it’s hard to imagine that people won’t buy his music or attend his concerts in 30 or 40 years. The reason for this is that people of all ages can relate to his music. Many of his songs use chord progressions that were common in the music from the 1950s and 1960’s but his lyrics, vocal phrasing and sound are contemporary. By combining these elements in his songs he has effectively developed his own genuine style of music that people in many parts of the world love. In addition, Ed Sheeran appears to be a down to earth, likeable guy who, if he continues producing great songs, will have a successful career for many years to come. 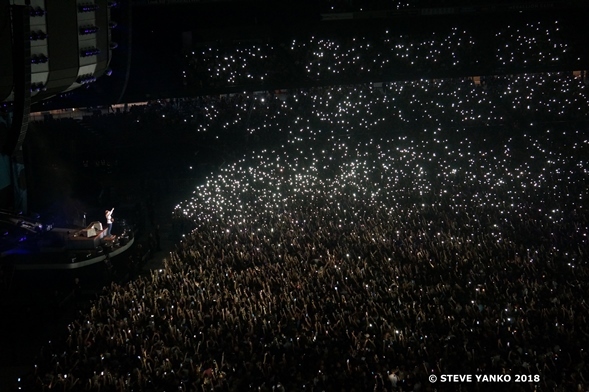 Ed Sheeran connecting musically with his audience in Melbourne. Overall as a musician, a fan and a “Super Dad” I really enjoyed Ed Sheeran’s concert. Tonight, in every part of the world there are musicians performing on a stage all by themselves and they will try and connect with their audience. Last night, armed with great songs, talent and a passion for performing, Ed Sheeran easily connected with thousands of people in a large football stadium and made them incredibly happy and for that you can only wish him continued success.